We Make it Easy to Do Tough Jobs. Getting your gear shouldn’t be a headache. We offer more than just person-to-person customer service via phone, email or online chat. We have 24/7 web ordering, can integrate into your existing ordering platforms and offer custom solutions to meet your needs. Your team faces tough conditions - we make tougher gear. 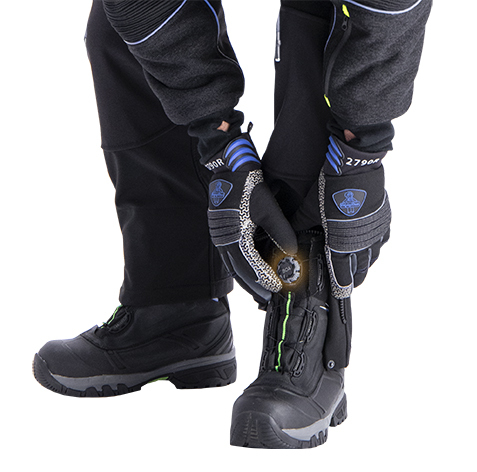 Tackle any job with the tools that keep them warm, safe and prepared to get the job done. We provide the nest job-specific products so your team can get to work safely. Being a National Account Partner gives you access to all the benefits listed below. It's exclusive access only available to those who qualify for the program. Our National Sales Team is out in the field every day – so you have access to unmatched expertise in insulated clothing, footwear and food safety solutions. Test out our gear before you outfit the whole crew with no-charge samples. Receive a discounted price on every RefrigiWear product. *Shipped in the continental U.S.
From in-house boot days & product sampling to custom online solutions we make sure your employees have the right footwear for your unique environment. Add a professional look to all your gear by adding logos, names or other info with in-house embroidery services. Add safety features, get a custom color or expand size offering with our in-house manufacturing. When you open a new location, they enjoy free freight and a 5% discount for the first 30 days. Get the most bang for your buck and stretch the life of your gear with our discounted repair and laundry services. Our Dahlonega, GA based Customer Service team is ready to help – via phone, email or chat. Detailed purchasing reports help you optimize your spend with RefrigiWear (available per location or companywide). Through our website, or a custom integration with your system, you can order RefrigiWear online 24/7/365. Show them what all their hard work means to you with the annual Warehouse Heroes of the Year Award—exclusively for National Accounts. So you can get to work. Your day is full enough – you don’t have time to become an expert in the protective gear your team needs. That’s why you can rely on us. We have over 60 years of experience that backs our products, our services and our teams. Save time, spend smartly and don’t worry about protection when you have RefrigiWear® as a partner. or plan a visit to RefrigiWear headquarters.